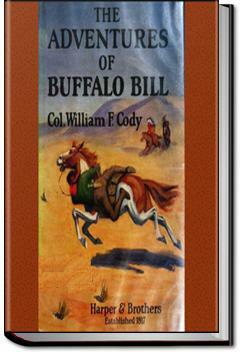 Buffalo Bill was arguably, the most recognized man in the world when he penned this book. The first four stories are of some of his adventures and the remaining 6 are autobiographical. All of them have been proved to be historically accurate in all important aspects. From his service as chief scout for the 3rd Cavalry during the plains wars, to his pony express service and finally the story of how he got his nickname "Buffalo Bill", everything is larger than life. Killing 4,280 buffalo in 18 months for the railroad workers was an amazing feat. Follow along as he tells of his Indian campaigns and then his world famous "Wild West Show" later in life. The foreword gives a brief summary of this man's amazing life. He respected the Indians and urged equal rights for women, something amazing in itself for his time. . . .Indians had surprised the cattle herd in charge of the McCarthy brothers. It was with difficulty that we discovered any traces of anybody ever having camped there before, the only landmark being the single grave, now covered with grass, in which we had buried the three men who had been killed. The country was alive with buffaloes, and having a day of rare sport, we captured ten or twelve head of cattle, they being a portion of the herd which had been stampeded by the Indians two months before. The next day we pulled out of the[Pg 13] camp, and the train was strung out to a considerable length along the road which ran near the foot of the sand hills two miles from the river. Between the road and the river we saw a large herd of buffaloes grazing quietly, they having been down to the stream for a drink. Interesting read that provides a glimpse of the history of the American frontier through the lens of one of it’s more famous (infamous?) characters. Great for historical context, but the stories are likely exaggerated and brutally racist in our current time. This is a fantastical read, which makes me take nearly everything Col Cody says with a big pinch of salt. Still, for the larger than life figure Buffalo Bill has become, it is fitting that his autobiography is a tall tale. Oh, how colorful to have contests of who can kill the most buffalo with the short time with a rifle from a horse! And leave most of the carcass on the grasslands. Buffalo Bill had the gift of storytelling, that's for sure. A must-read for anyone interested in the history of the Wild West. I enjoyed reading this autobiography. It was well written and very exciting although it only covered the first part of his life. An excellent read, one I thoroughly enjoyed. It is well written and ties in with what McCollough has written about Buffalo Bill's reception in Paris. I am not an American, but am nevertheless fascinated by this period in their history. It was a boiling pot of adventure and violence. This is one of those rare occasions in history where many factors came together to create the perfect environment for extreme heroism and evil to flourish.